Martial Artist and BodyMind Training expert, Raymond Ahles is a teacher of the martial and healing arts with over 25 years of training in the Chinese Martial Arts. His background in Eastern philosophy and extensive experience with meditation and mindfulness practice makes him an valuable source of information on a variety of topics. Q. You have been training in the martial arts for 27 years now. What keeps you motivated? Raymond Ahles: That’s easy: the results I get. But to elaborate, I’d say I see a direct correlation between the time I put into my practice and how I feel. I’m happier, more positive and optimistic, more centered and at peace with consistent practice. I find that it keeps my body looking and feeling younger, stronger and more relaxed. There’s less stiffness. As I get older, I feel I need it more than ever. And I’m never satisfied with my level of skill or understanding of the art. It still intrigues me. I still want to go deeper and understand more. Q. What makes the practice of martial arts special? Why dedicate so much time and effort to the practice? People practice martial arts for many reasons but I would say what makes it so special is the BodyMind Training aspect of it. Martial arts uses the body as a vehicle to train and discipline the mind. Q: Can you expand a bit further on this concept of BodyMind Training? The complexity of the movements requires a fully engaged presence of mind. You must be fully engaged in order to accurately perform the movements, to execute them with precision. So the body can be used as a focal point to train the mind. Bring it to one place. It can be practiced at a level where it transcends just physically going through the movements. We can train ourselves to use absolute attention. BodyMind Training is a meditation – physically using the body as your focal point and, by fully engaging your mind on the movement of the body, you connect the body to the mind and that is key. You see something interesting happens when you learn to quiet your mind. You can think better, more clearly ultimately leading to a higher state of consciousness. You start to tune into your inner thoughts. You begin to notice how you react to things like challenges and frustrations. Physically using the body you can get the circulation going and you can think more clearly ultimately leading to gaining better control over our emotions and start making better decisions. With an increased awareness, you begin to recognize what things you don’t have control over and need to accept and what you do have control over – only yourself. You start to see the areas where you need to work on yourself. This is how we can begin to experience our awakening. This is what BodyMind Training can do. Q: Clearly you are someone who gives a great deal of thought to what you do and how you spend your time and energy. You’ve practiced the Chinese martial arts style, Ba Gua Zhang, also known as Pa Kua Chang since 1987 and have been studying with your current teacher, Master Bok-Nam Park since 1991. What do you love most about Ba Gua Zhang? Raymond Ahles: I love that it’s an ongoing challenge, very complete, and never finished. Q: How is Ba Gua Zhang so complete? Raymond Ahles: There are many who make the claim that their martial art is complete. But, in my experience, they are often focusing on the technical skills that it includes punches, kicks, grappling, ground fighting, etc. Some go around searching for techniques to add to their repertoire but that is not what I mean or what my teacher taught. Q: What did your teacher teach? Raymond Ahles: When an art is based on natural principals and the student understands those principles he or she can adapt to any need or situation. His teacher, my Tai Shizu or Grand-teacher told him “I am not your shifu – nature is your shifu.” So, be it for health or self defense, a complete system goes beyond trying to give all the answers and puts in the student’s hands a way to figure out what is needed and when it is needed. It the ancient story of “give a man a fish you feed him for a day; teach him to fish and you feed him for a lifetime.” The principles always work, techniques don’t. Situations change and that is the essence of Ba Gua. It is the art of change. Q. If there was one thing early on in your training you wish you had done differently, what would that be? Raymond Ahles: As a traditional Chinese martial artist I feel very fortunate for the early experiences I had. It’s hard to imagine a different path since it’s the very reason I have such a deep appreciation for my teacher and what I’ve learned from him for the last twenty years. Q: In your opinion, what is the difference between someone who practices the martial arts and someone who is a true martial artist? Raymond Ahles: The martial artist incorporates the practice in everything he or she does. There is no separation. Be it self defense, exercise, or work and relationships, the philosophy applies effectively for more desired results. The martial artist leaves the outside world and all their troubles outside the dojang or dojo and takes the lessons learned inside into their day to day lives. Q: You are the owner and Chief Instructor over at The Blue Dragon School of Martial Arts. If I walked into your dojang (dojo) over in Bergenfield, NJ, what might I observe that might be different than countless other schools across the country? Raymond Ahles: Actually, others have made observations about this very thing that they have shared with me. They see a quiet focus in our students, a respect for self and others. They see the time that people have put into the art, particularly at advanced levels. They also have noted that there is an absence of competition. No sense of trying to one up one another. That is a culture that has been carefully cultivated at the school. The dojang is a place of enlightenment. We encourage the students to use the dojang as a place to work on him or herself. Q: What made you decide to become a martial arts teacher? Raymond Ahles: When I was in my first six months of practice, my life turned around 180 degrees. I was in high school, partying, drinking and all those other reckless things. The martial arts opened my eyes and got me to realize what I was doing, how I was thinking, and where I was heading. Fortunately for me, that all changed for me at that young age. It was those results, that new way of thinking that I knew I wanted to share. It’s a better more awakened life that I believe the practice of real martial arts can offer. I learned about what I was in control of and it wasn’t the outside world. So, real martial arts in my opinion, is about that inner work. We would have a very different world if more people learned and then taught the real martial arts. Q. What do you find most challenging about being a teacher of the martial arts? Raymond Ahles: Consistently living up to the ideal I have of what it means to be a teacher of the martial arts – to be “Shifu”. Knowing what a profound influence the martial arts can have on a student’s life brings with it a great deal of responsibility. To me, when I come up short I am cheating my students of what they can experience through their practice. I take that very seriously. I could take a lighter attitude, not care and act as though it doesn’t matter except I know what a difference it can make. There is so much suffering in the world that could change if the practice of real martial arts were a part of more lives. By “real”, I mean a practice that fully incorporates meditation to calm and discipline the mind. Get to know your true self first. Then, respect, consideration, acceptance and compassion for others more easily follows. Conveying that message clearly so others understand what it is we do I also find very challenging. Q. What do you think is missing from most students martial arts training curriculum today? Raymond Ahles: Without question, it’s meditation. I’ve met very few martial artists who actually meditate at all, let alone consistently. I’ve met even fewer who actually consider it a fundamental component of their training. However, I would bet that if we took the time and went back a few generations of their lineage, where their chosen art came from, we’d find a master who meditated regularly. And that master would tell them that through meditation that is how they became a “master” (a far overused and too easily claimed title). Too many got caught up in the physical aspects and the training got severed for future generations. The practice is incomplete without meditation. Martial arts without meditation in the most optimistic scenario, is still good exercise as it uses the whole body. However, a more pessimistic scenario can say it’s all about violence, competition, and beating others. My teacher would say it’s like handing a gun to a child. Martial arts with meditation is about discovering and conquering yourself. It’s about the inner battle. Q. What do you think is the greatest misconception people have about the marital arts? Raymond Ahles: That it is all about fighting, tournaments, and black belts. That it’s about winning and being able to beat people up. That it is a competition, in life as well as on the mat. We could teach someone to fight rather quickly if that was the primary goal but that essentially cuts off their head and doesn’t serve them in their lives. I’ve seen many times where people who think they have no interest and then discover what it really is and what it can really do for them and suddenly they are one of the best students. 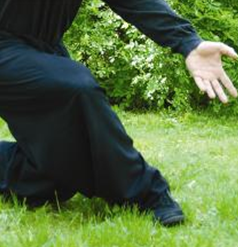 Many of our students come through the health or qigong side of the art, only to then become comfortable with the place and suddenly they are interested in doing more. They want the full training which includes the martial side. How could this happen if they were truly disinterested? It’s because it was a lack of information. They didn’t really know what it was that they were not interested in. Q: There are a lot of martial arts schools out there, how can a student a spot an authentic teacher of the martial arts? Raymond Ahles: Do they live what they teach? In other words, if they sell you on the benefit that it’s great exercise is that how they keep in shape (if they are in shape) or do they have to go to the gym for a very different workout? Do they apply the practice in their everyday lives? Do they meditate regularly? Q: What about the commercial aspect? How does a new student walking in basically separate those who do it as a business versus someone who truly knows their art and has a passion for teaching? Raymond Ahles: You look at the senior students, not just their skill, but their attitude. In my opinion, an authentic teacher will convey a sense of calmness and confidence as should their longest students. There’s something else…Is that teacher actually teaching? Or, do they focus in the front end so to speak, dealing with sign ups and business primarily. It may just be how they make their living but the passion is lost. So again, they get their workouts at the gym and not by practicing. If they still workout at all. Q: Do you ever turn away students because you don’t think they are a good fit for your school? Raymond Ahles: (Chuckles) Oh, yes. We have a six month trial and it goes both ways – they try us and we try them. If they don’t fit they can easily weed themselves out but we also may not renew them. If someone simply wants to learn to fight and that’s all they care about, I have sent them down the street to the MMA school. Let them get that out of their system if that’s possible. Of course, we will teach them how to defend themselves right from the get go but there’s a difference. Q: So how do you deal with big egos in the dojang and have you seen those egos deflate, change and adapt to what you are trying to teach them? Raymond Ahles: I have seen big changes in those who stick around, yes they weren’t truly happy and they start to discover why. It’s traditionally called: “Discovering the ego” the first step in making real progress in life. This is how we can begin to see life as it is and not simply as we think it is. We start realize our programming and biases and begin to recognize our filters. Only then can we break through and see clearly. What I mean is there’s also the fantasy side of peoples’ interest in the martial arts. I think we bridge that gap from fantasy to reality rather well because we actually do the training that’s led to legendary stories of martial artists. The tools are there, it’s up to the student how far they want to go. Q. What are some of the common roadblocks or impediments in a student’s training and development and what can be done to overcome them? Raymond Ahles: We have a “gotta have it now” mentality in our society. And most things we want we can indeed have now. I just ordered a book from Amazon and got it the day before I ordered it! Okay, that’s an exaggeration obviously but patience is a major roadblock for people. Some things take time, and that time will go by regardless. So it’s what you do now that shapes our tomorrow. The term “kung fu” essentially means “achievement through consistent effort over time” but it is hard for a student to grasp it. We were taught to get to the end of things. Climb that mountain and move on to the next one. Keep striving for things yes, but, little attention is on the journey itself. That IS life, the journey, not the destination. So, just practice for the sake of practice and the consequences are better health and fitness, more inner peace and happiness, more awareness and personal safety. All of the obstacles are in our minds – we block ourselves because we attach to the results that we expect and not the ones we are actually getting. Q. So many martial students may wonder what makes a teacher wish to teach a student… or not want to teach them at all? Raymond Ahles: Sincerity. If the student really wants to learn they don’t waste time arguing and thinking they know better. If they did, then they wouldn’t need to be a student would they? You go to a teacher to learn, not to show what you know. So if the student knows too much, at least in their perspective, then I wouldn’t want to waste my time – they’re not listening anyway. It’s the classic example, “empty your cup” – only then you can learn. We always want the student to think, but the good student recognizes the experience of the teacher and that he or she may not understand the reasons for things or where the teacher is coming from because they simply do not have that experience.